Hi, my name is Francisca and I am in Oceanside, Ca. I moved in to this new home almost two years ago and it came with a beautiful flowering Sago palm. 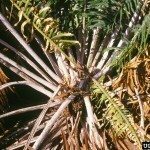 Since then, the palm has not grown any new leaves, it has browned, but it has flowered twice since then. I was hoping that this spring it would not bloom again, but as i started clearing the old flower seeds from it, I noticed that a new flower is emerging. I appreciate the beauty of the flower but the appearance of the palm as a while is not pretty anymore. It looks as if I let it go. What do you recommend? Do I chop the flower head? If I chop it off, will new leaves grow soon after? No new leaves grew in between flowering each time before. The flower emerged in spring, got huge during summer and fall and withered away in winter only to bloom again. It is unusual for your Sago to bloom that frequently, it generally will flower once every 3 to 4 years! Removal can be done and links below will help you. I do think the cycad may need some nutrients to help with support and growth. Monthly feeding is recommended.